Items shipped in flat. The bowknot need be tied by your side ** Shipping & Delivery ** 1. We ship in 1-2 Days after payment is cleared (do not ship Saturday, Sunday & Other Holiday). Items will be delivered from our warehouse for with express service like UPS/ARAMEX/OTHER/FEDEX & within the specified period. *(Delivery usually takes 5-6 Business Days. Please do not count Saturdays, Sundays and public holidays or postal work strikes, serious weather as business day) ** Feedback ** We put our best effort to provide high quality products and services to our customers. If you are satisfied with our service, we hope that you may kindly leave a positive feedback and 5 stars ratings to us. Every feedback and star means a lot to us. If you are not 50% satisfied, for whatever reason, please do email us to give us a chance to get it right before leaving a neutral feedback. We appreciate your understanding and generosity! ---Shipping & Delivery--- Please Pay More More Attention Below Information about the delivery time. If the listing has "Prime" Label , Mean that the package will be shipped from Amazon USA warehouse Directly. For Non "Prime" Order, we will ship the package from our China Factory, Shipment Will Need About 7-12 Days Delivery by FedEx or USPS. ---Item specifics--- The Bands fit width of chair 35-50CM. 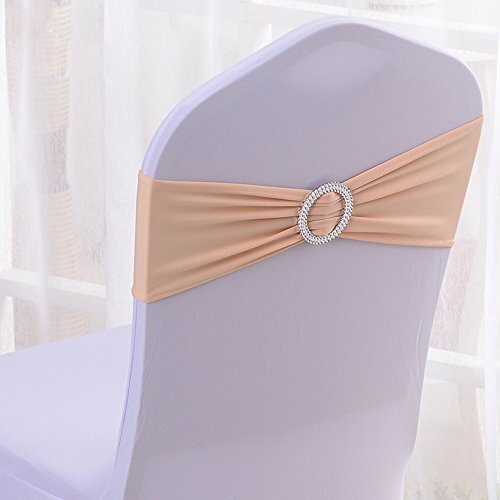 Elastic Stretch Spandex Chair Bands Bows For Wedding Home Party Suppliers Decorations. 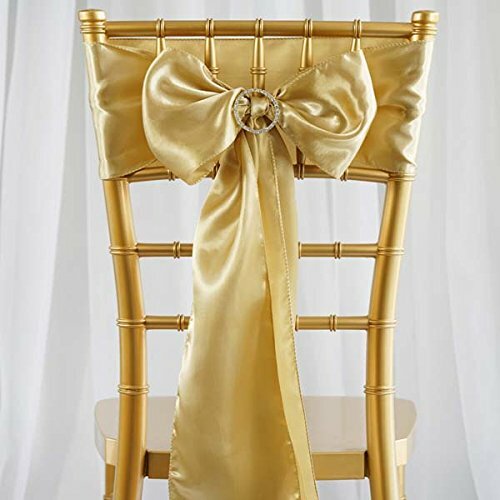 ---Description--- Our chair sash is widely used in wedding, hotel, banquet chairs with advanced crafts, delicate details, durable fabric. We guarantee that the components of this item are all in good condition. Thanks for your supporting and purchasing, We Do Our Best to Shoot and Show Actual Colors in The Pictures. Please Note That Due to Limitations in Photography and The Inevitable Differences in Monitor Settings. 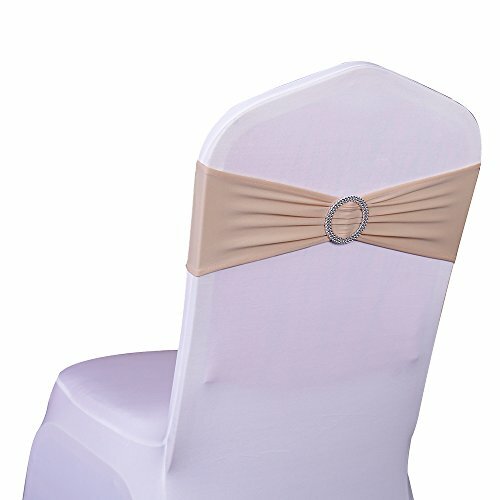 we have many kinds of items for wedding and events, For example: Chair Covers, Chair Sashes, Table Runners, Table cloth and so on, If you are choosing some items for wedding or event decoration, please check our store or contact us directly ---Packing List--- 100pcx Elastic Chair Sash Note: The size maybe a little error due to manual measurement. Colour: Champagne Items shipped in flat small pouches. The bowknot needs to be tied by your side. ** Shipping & Delivery** It would be shipped by Amazon fulfilment centre which normally deliver with 1-2 days in case of any weather conditions or other related delays you should expect delivery max within 3-4 days. ** Feedback** We put our best effort to provide high quality products and services to our customers. If you are satisfied with our service, we hope that you may kindly leave a positive feedback and 5 star ratings to us. Every feedback and star means a lot to us. If you are not 50% satisfied, for whatever reason, please do email us to give us a chance to get it right before leaving a neutral feedback. We appreciate your understanding and generosity! 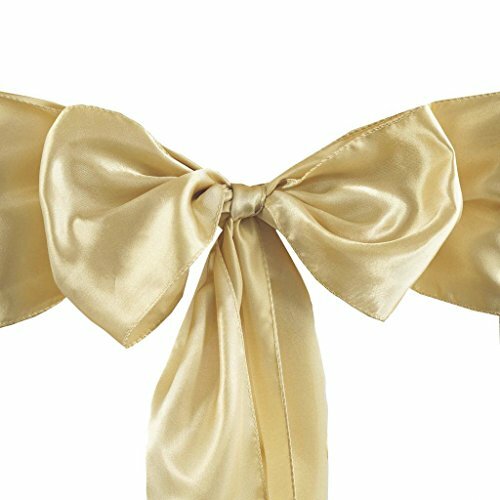 Efavormart 25pcs Champagne SATIN Chair Sashes Tie Bows Catering Wedding Party Decorations 6 x106"
Brand New Satin Sashes;High quality shimmering satin. 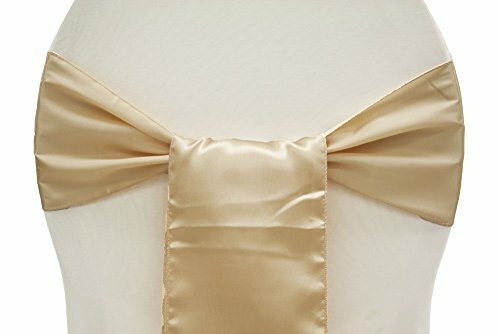 Edges are hand sewn to form an elegant look when tied into bow form.Measure: 6" wide x 106" long Uses: chair cover, wedding, parties, celebrations, graduations, or any special event. Sashes are shipped untied. How to Care: Hand wash only. Hang dry, don't use dryer. Combining a Satin Table Runner in white with your Wedding Tablecloth or other Special Event Table Linens will take your table presentation up to the next level. Our 12 x 108 inch satin table runners are luxurious to the touch, and are the perfect width to fit large and small banquet table linen setups. Start with a polyester tablecloth or satin tablecloth base, then add this satin table runner in one of our wide variety of complementary colors. You could even create a third level by topping this inexpensive wedding table runner with a satin chair cover sash, or a shimmering organza chair cover sash. These premium, beautiful sashes from ELINA HOME are the same as those supplied for lavish events. 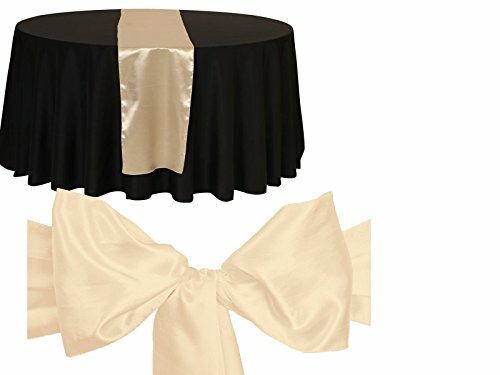 MDS TABLE LINEN TRYLYC They are crafted from extremely elegant, high-quality, luxurious, silky satin, ensuring each sash will look fantastic after one use or many making them more practical then renting. All of the sashes' edges are finished and surged/overlocked with color-matched thread. 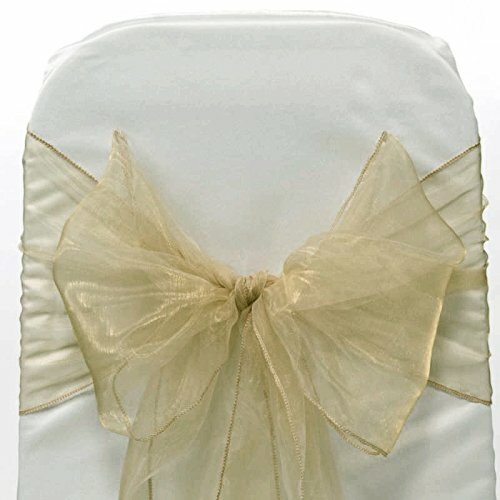 Compare prices on Chair Sash Champagne at ShoppinGent.com – use promo codes and coupons for best offers and deals. Start smart buying with ShoppinGent.com right now and choose your golden price on every purchase.